If the Albuquerque Balloon Fiesta is on your bucket list, but you’re concerend about wheelchair access, then worry no more, because I’m happy to report that this annual event boasts excellent access for wheelchair-users and slow walkers. The good access begins with the accessible parking area, which is located just steps away from the north entrance. Since they are using a standard lot for the accessible parking, it’s not striped with accessible spaces; however there are volunteers on hand to make sure that you won’t be “parked-in”. In other words, if you have a van, you will be given enough space to deploy your ramp, and the attendant will direct the next visitor to park an appropriate distance away from your vehicle. Although it sonds a bit haphazzard, the volunteers are well trained, and in the end the goal is to make sure everybody gets an accessible parking space that meets their needs. Standard parking rates apply to the accessible lot, but make sure and bring your placard, or you will be directed to another lot, which is located much further from the entrance. Slow walkers wil be happy to know that there is also a golf cart shuttle service to and from the accessible parking area. There is also a wheelchair and scooter rental tent right next to the north entrance. A word of warning – the Fiesta grounds are very large, so if you have problems walking very far, renting a wheelchair or a scooter is the way to go. 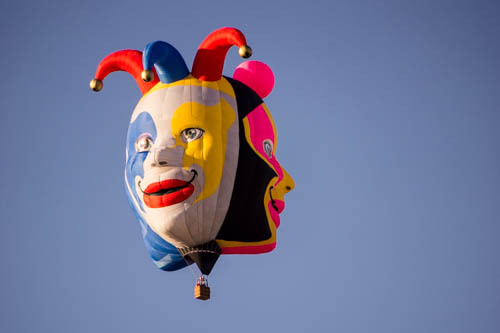 Even if you don’t use an assistive device at home, it will allow you to save your energy and enjoy more of the Balloon Fiesta. You’ll also be happy to know tht there are wheelchair-accessible porta-potties located throughout the grounds. As for pathway access, that is good too. There is an asphalt area around the field, which is level and very navigable in a wheelchair. The grass area is also level, and realtively rut-free, so as long as it’s dry it’s also doable. To be honest the biggest access obstacle is the crowd, and to that end it’s just best to go on weekdays, as the weekend brings out a lot of families with strollers. Still, whenever you go, you’ll be treated to a beautiful show. Plus it’s kind of fun to watch the balloons inflate. Don’t miss the special shapes, and try and catch at least one evening glowdeo and the fireworks display. 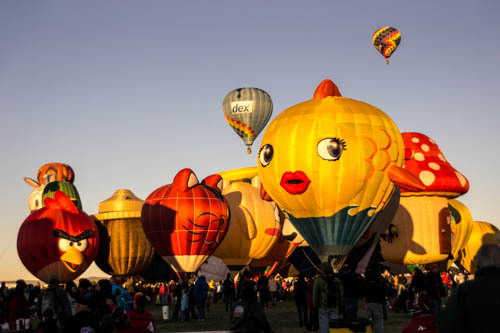 So make plans to cross the Alburque Balloon Fiesta off your bucket list. Start planning now for 2014, when the event will run from October 4-12, 2014. This entry was posted in Uncategorized and tagged accessible travel, Albuquerque, Balloon Fiesta, fireworks, glowdeo, slow walkers, travel, wheelchair, wheelchair travel by Candy B. Harrington. Bookmark the permalink.